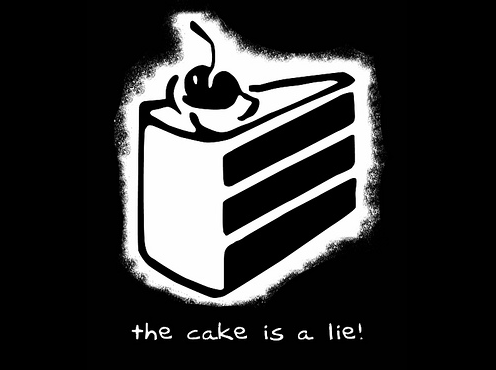 If you haven’t come across “the cake is a lie” meme, try reading the quick post on Medium by Tobias van Schneider, Design Lead at Spotify (aside: anyone else notice just how good Medium is now becoming as a platform for both content creation and discovery?). In essence, the statement means “your promised reward is merely a fictitious motivator”. In other words, you’re striving for something that you’ll never get. Schneider puts the idea in the context of risk aversion, pointing out that as we get older, we devote more of our time to trying to avoid losing the many things that we’ve accumulated (income, personal image, gadgets) than we do to pursuing growth. Hence the struggle that banks and other established businesses have to actively pursue innovation at any meaningful level. Research has proved the loss aversion theory which tells us that people tend to strongly prefer avoiding losses to acquiring gains. On a corporate level, you could argue that’s no bad thing. If that wasn’t the case, we simply wouldn’t have a business environment in which a startup with “nothing to lose” can seek to disrupt an established industry. However on an individual level, the warning should be considered more deeply. Schneider suggests that every time you face a big decision, ask yourself whether your dilemma about whether or not to proceed is simply down to the fact that you’re looking to protect that cake. If so, be very wary. You don’t get happy by putting all your energies into protecting a cake that you never actually eat. Today’s my 100th successive blog post. I’ve been blogging (on this website and elsewhere) for a few years now but never with this level of consistency. So what changed? As most people are aware, I’m a fan of Seth Godin’s work. And as he says, “The only purpose of starting is to finish, and while the projects we do are never really finished, they must ship”. The perfect is the enemy of the good. If I was worried about perfect grammar, ground-breaking commentary and creating a comprehensive database of knowledge on the subjects that interest me, I would never have got started. Posts would take days rather than hours and we all know that real life has a habit of getting in the way whenever it can. If we’ve never met in person, you might not know that I enjoy acting. And if there’s one lesson that I’ve learned from my entirely undistinguished but thoroughly enjoyable time on stage to date, it’s that the very best actors are invariably the ones who aren’t acting. Or – more accurately – they’re living in the moment and responding naturally to everything that takes place in front of them. Undoubtedly, there’s talent involved. But, even more importantly, I believe that it’s also a habit. Crucially, they’ve managed to construct an environment in which they’re free to take the risk of getting things wrong. The best are never afraid of falling flat on their faces because that’s what gives them the chance to develop their ideas. It’s all about eating the cake, not protecting it. I guess that’s what this blog represents to me. An attempt to build and maintain a place where I can do the same. For those who are reading it, thanks! For those who aren’t – well, I intend to keep on going. Because to quote Godin once more, “The cost of being wrong is less than the cost of doing nothing”. Satoshi’s Songs: Can Bitcoin Save The Music Industry?